The first step into the victorYZone has been made easier with the release of Yamaha’s much aniticpated YZ65 junior MX race bike. Demo ride events across the nation were organised to celebrate the release of the new machine on 3 June. And over 200 riders aged between seven and 12 were lucky enough to swing a leg over the new race bike. 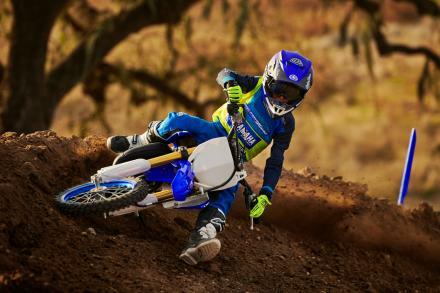 “It’s great that we finally get the YZ65 in our hands and it’s a huge addition to the YZ line up,” says Yamaha Junior Race Team boss Scott Bishop. “The weekend demo events were the best way to showcase the bike – we simply allowed young riders to test the YZ65 and make up their own minds on just how good the bike is and how instantly competitive it will be,” he adds. “Feedback from everyone who test rode the bike was glowing and the national demo day saw heaps of young riders get to experience this exciting racer,” ends Bishop. “The YZ65 represents the first step on the victorYZone ladder and is the ideal entry point to join the bLU cRU. Yamaha offers a model for every category so the step up process has never been simpler,” adds Yamaha Sales and Marketing Manager Matt Ferry. A Tasmanian event will be announced soon. Yamaha ensured the fun was captured by having photographers at all four events who posted hi res images of the riders to download. Film makers also attended all events which amplified the experience.